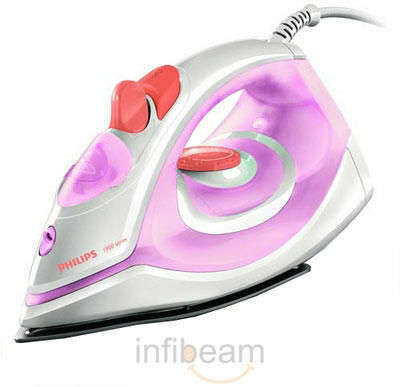 The Philips GC1920 is a steam iron designed for quick and easy ironing experience. This Philips steam iron has a Black American Heritage Soleplate for easy gliding over the fabric. The pointed tip of this Philips device makes it easy to manoeuver around buttons and collars. The ergonomic handle of the Philips GC1920 allows for a relaxed and comfortable grip. 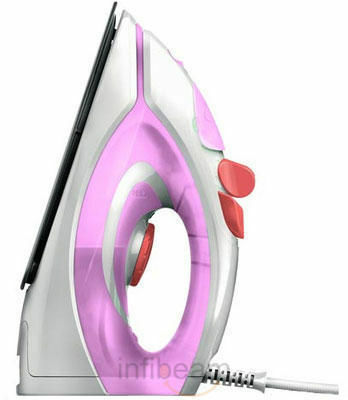 The weight of this steam iron is 1.06 kg and it measures 26.1 x 11.5 x 13.6 cm. The swivel cord on the Philips GC1920 has a cord freedom of 180 degrees that aids in free left and right movement. This reduces the pressure on your palm and wrist during extended ironing sessions. This cord measures 1.8 m for convenient access and manoeuvrability. The water tank capacity of Philips GC1920 is 180 ml. The sideways opening and extra-large door of this water tank makes filling and emptying of water super-quick. The spray function of this steam iron produces fine mist that evenly moistens the fabric and lets you remove wrinkles with ease. The Philips GC1920 has a variable steam setting for you to set steam levels according to your requirements. The continuous steam output of 17 g/m in this steam iron aids in better crease removal from the fabric. The self-clean calc management system of the Philips GC1920 helps prevent scale build-up and gives longer life to the iron. The calc clean solution is a liquid that flushes out the calc particles form the iron. The maximum power consumption of Philips GC1920 is 1440 W. It is preferred to use an iron with high power wattage as they tend to heat up quicker, thereby saving your time. The power required by this stem iron to function is 240 V. The Philips GC1920 has an Iron temperature ready light for thermostatic operations. This light indicates when the iron has reached the required temperature and is ready to use. Good service and prompt delivery.Good product too.